When a budding binary options trader decides to make trades, he or she needs to have something to go on. It can be difficult to go into the whole trading process alone despite all the information available online. In fact, there are even Education sections available with most binary brokers which provide plenty of educational materials. Everything from eBooks on binary options trading to webinars and trading glossaries to a demo account. Still, many traders still feel intimidated by the whole prospect of binary options trading. This is not surprising traders have to make all the decisions on their own. From selecting the underlying asset to which trade options they want to use to the final decision of the likely price direction. To help them in their decision-making process and at the same time answer the question of when should you use trading signals, we offer some valuable advice in this article. Considering the advancements made in the field of technology, newbie binary options traders both in South Africa and around the world, now have many alternative ways of trading binaries. Apart from the standard manner of selecting a binary broker and start to do binary options trading manually based on their own predictions, South African traders can use trading signals. A trading signal is an information about the time when the market or an individual asset is likely to go upward or downward in value, thus signalling traders to either open or close a new position. The signal aspect is the information South Africans can draw from a particular kind of movement or a certain fundamental change in the asset or market. All traders who lack experience or simply have no time or inclination to educate themselves beyond the basics the ones who can get ahead if they use trading signals. But generally, trading signals are sought after by everyone from the greenest trader who just opened their account to the most seasoned professionals in the business. This is due to the fact that with an accurate trading signal, South Africans can make a lot of money in a short period of time provided they recognise and act on the signal correctly. Granted, there are a lot of chances to make an error, so a note of caution is advisable. The risk of loss is always present and binary options trading is not exempt from this. Further choice South African traders have is given in the manner of generating signals. Some trading signals are generated by finical experts. Others are created by sophisticated and advanced trading software which uses a trading algorithm to first scan the market and gather all viable information and then creates trading signals. Lately, the latter has become very popular. The reason for that even the most inexperienced traders have the equal chance of participating in the binary options trading. Another reason is the simplicity of binary signals and automated binary trading. Binary options trading has always been greatly dependent on technology, so it is hardly surprising to see that binary trading keeps evolving with the technology. Nowadays, binary options robots or binary signal providers combined trading signals together with automated binary trading to provide their traders with the ultimate trading tool which saves times and simplifies the trading process. Binary Options Robot is one of the most popular trading software available to South African traders who are wondering when to use trading signals. South African traders do not need to pay nay extra fees as trading signals generated by this robot are free. With this advanced trading solution traders simply adjust their preferences concerning their preferred underlying assets, funds they wish to invest per trade and the number of traders they wish the software to execute per day. Once traders select one of the binary brokers connected with Binary Options Robot and make a deposit, the Robot will scan the market and generate trading signals which have the highest chances of success. The trading signals are then sent to the trader which will either accept and Binary Options Robot will carry out the trade. Another solution is that the trader declines the trading signal and the trade will not be made. Further benefits of Binary Options Robot also include their VIP account with accompanying trading features which include risk level, five strategies and expiry time feature. Fintech Limited is another interesting choice for South Africans. 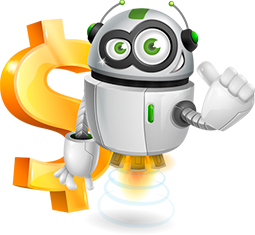 This is a free binary robot with a simple registration process and user-friendly platform. This binary robot appeared on the market in 2013 and uses a state-of-the-art algorithm to scan the market around the clock creating trading signals. Traders have plenty of control as they get to set their trading preferences and use advanced trading features like Sentinel feature and the Reverse Trading feature. South African traders can also set the Risk Level and use the mobile trading app. With Fintech Limited, traders can select to use either automated mode or a manual mode of trading binaries. Daweda Exchange ATS, automated trading software which is a part of a popular broker Daweda Exchange is also gaining popularity among South Africans. This is another free trading software where traders need to make a deposit but do not pay any extra fees for the actual binary signals. The trading platform of Daweda ATS is simple, all tabs are conveniently located at the top part and traders get to monitor all trades in the Open Positions tab. Daweda Exchange ATS will follow the settings set by the traders.